Having used the Evoluent mouse for a period of two or three months in 2010, I can easily sympathize with this sentiment. Compared to a regular mouse – or even to an inexpensive “ergonomic” design – the Evoluent is like a permanent vacation for your hand. While wrist pain was not my complaint at the time I tried the Evoluent vertical mouse, there are many testimonials to indicate that it has helped people significantly with common RSI problems such as Carpal Tunnel Syndrome. I have no doubt that this is case, since the design removes almost all the load from your wrist, putting your hand and fingers to work instead. The Evoluent mouse instructions recommend two possible mousing positions, one with a wrist rest and one without. Normally, I join the vast majority of ergonomic wisemen in abominating those gel-filled wrist rests, which purport to be ergonomically beneficial, but can actually increase the chance of Carpel Tunnel Syndrome by doubling the pressure on the most vulnerable part of your wrist. Because of the Evoluent mouse’s orientation, the tender underside of your wrist comes nowhere near the wrist rest; instead, the less vulnerable outside of your wrist or forearm can be placed there, allowing your hand to float around the mouse. I tried this arrangement briefly, but found I preferred to rest the outside of my hand on the work surface and let the rest of my arm float. This is the other position recommended by Evoluent. It’s probably a good idea to try each for a few hours before making a decision. One of the truly aggravating things about ordinary mice is their lack of buttons. A typical mouse of the type that comes with your computer has just two buttons, plus a cheap scroll wheel that may purport to double as a center click. This so-called center click is often so stiff that it proves nearly useless, at least for me. 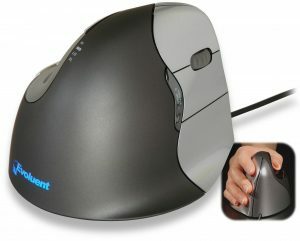 The Evoluent vertical mouse is a five-button model. To be fair, one of those “buttons” is a scroll-wheel with typically poor clicking action, so it’s really more of a four-button mouse as far as I’m concerned. The three main buttons are all properly sized and easy to click, and there is a fourth useful button on top of the mouse where the thumb can access it by venturing a short distance out of its nook. The Evoluent vertical mouse includes software to re-map the buttons, which means you can not only change the defaults, but get pretty creative as well. You can, for instance, set any button to double-click, which will save you thousands of finger moves over time. Even more conveniently, you can set a special function for each button depending on what program you are using at the time! One caveat here: It’s easy to waste hours trying to find the absolute optimal configuration of your mouse buttons. To avoid destroying productivity, I recommend you come up with a reasonable setup, then quit thinking about it. I am not a medical professional, and I don’t have any kind of degree in anything related to ergonomics. Some who do, however, have told me that the Evoluent mouse (and in fact virtually any vertical-design mouse) has a potential ergonomic issue compared to other devices. The gripping force required to move and click the mouse, it seems, places additional unhealthy stress on certain muscles and tendons in the hand. Other designs remove the need for gripping and benefit from the force of gravity when clicking. I am sure that Evoluent could bring their own team of experts to declare this theory incoherent nonsense, and perhaps they would be right. I myself never experienced such issues during the time when I was an Evoluent user (though I still prefer Contour’s Perfit mouse for other reasons). 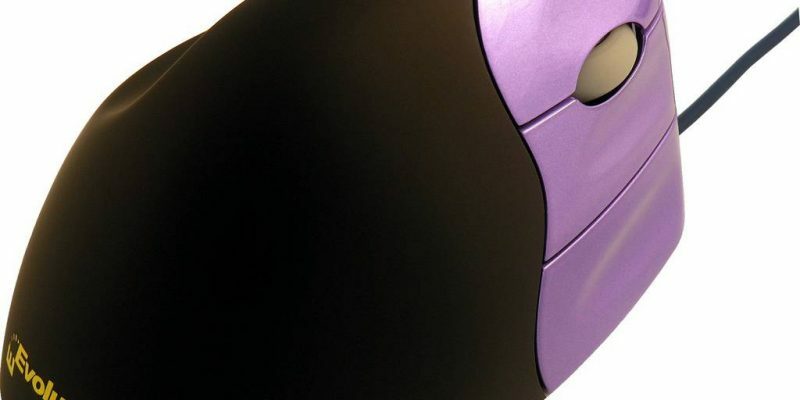 One thing on which I think virtually everyone would agree is that the Evoluent mouse is a huge ergonomic step up from the mouse that probably came with your computer. I am at a loss to explain this second problem, but I am also not the only user to have experienced it. Whether it is caused by the vertical orientation or perhaps by something in the plastic I don’t know, but finger grime accumulates faster on the buttons on the Evoluent mouse than on anything I have ever seen. When I used the mouse, I had to clean it virtually every day or it would get quite nasty; my current mouse only needs attention every few weeks at the most. If it cures your carpal tunnel, this hardly a big enough problem to worry about, but I would still love to hear an explanation for why it is such a grime magnet. Despite the fact that I don’t currently use it myself, the Evoluent vertical mouse is the #1 ergonomic mouse I would recommend to most people. While it may not offer all the benefits of more advanced ergonomic systems, it also doesn’t scare users away with a weird appearance or force them to take special training. Anybody who has ever used an ordinary mouse should have no trouble adjusting to an Evoluent vertical mouse. Disclosure: This review was made using my own Evoluent Vertical Mouse 3, duly purchased at the retail price.